Whereas the work of those prior artists makes a point of placing their figurative protagonists in complex, highly narrativized environments, Roberts purposefully separates her figures from any indication of context save that which might be inferred from their flamboyant dress, ungainly body language and ambivalent facial expressions. All of these aspects come together to force the viewer to take note of what is truly salient about them, that being their affecting call for the viewer to exercise a particular kind of empathy toward the cobbled-together identities of young persons who, through no fault of their own, are represented in a state of uncomfortable isolation, with all of its potential peril. This is not the place to debate whether or not collage was an African invention that was appropriated by Pablo Picasso in 1912. But it does bear mentioning that collage is a technique ideally suited to the African American historical experience, one in which Africans were forcibly removed their homeland and pressed into service as chattel labor half way around the world. After the post-Civil War ratification of the 13th and 14thAmendments, that experience continued on in a state of second-class citizenship for well over a century, creating a situation where improvisation made much more sense than did other ways of engaging the world, partially explaining the ascendancy of various forms of jazz throughout the early part of the 20thcentury. When one is uprooted, one has to make do with what is available, and seeing the unrecognized potential of otherwise neglected methods and materials became a skill in its own right, evidenced in works by African American artists such as Raymond Saunders, Kara Walker and Wangeschi Mutu. Someone more cynical than myself might be tempted to see these works as a conflation of the Black Lives Matter and the #MeToo movements, parading under the timely banner of Black History month. Such an opinion could only be forgiven if its bearer had not actually seen Roberts’ exhibition, as its seductive call to empathy abolishes such cynicism. In terms of the themes and material manifestations of these works, we see indications of identities that have been fractured or otherwise disrupted and then put back together from available materials and given new purpose, ergo the title of the exhibition Uninterupted, which speaks of the reversal of a moment of shattering trauma. Each of these works gives the viewer a lot to see. At first glance, it looks as if Roberts is working with fragmented magazine illustrations, some in color, others in high- or low-resolution grayscale. But most of the fragments are too large to come from normal-sized magazines, suggesting that they have been rescaled with a photocopier or digital printer. Clothing is indicated with jumbles of pulsating patterns that look as if they were taken from Bridget Riley or late Matisse, sometimes accented by other patterned shapes that are without hue — including at least four shapes cut from reproductions of Frank Stella’s Black Paintings from the late 1950s. Another collage titled Be Still sports a fragment from an early work by Robert Motherwell. The bodies of the girls stand in a kind of playful defiance, some with arms akimbo, some gesturing with hands or fists that are too large for the arms to which they are attached. Occasionally, the girls’ long limbs are articulated in thin layers of acrylic paint rather than collage, as are a few other pictorial incidents such as the oversized colorful shoes in Not Today or a copper hair comb perched atop one of their heads in About Face. More often than not, their rigid body language suggests moments of frozen indecision between the impulses to fight or flee. The faces that we see in these works are miniature emotional kaleidoscopes, running a full gamut from happy confidence to crippling self-doubt. They often seem too large for the bodies upon which they are perched. Certain bisected portions regard the viewer from a frontal position, while other parts peek out from a profile view. Some portions are in grainy color, while others are subtly mid-toned so as to defeat stark binaries between white and black, implicitly casting the subjects in the interstitial space between those two poles. In all cases, they enact the kind of undoing of indifference that writers such as Emmanuel Levinas and Judith Butler called for in their respective critiques of the ethics of rationalized exploitation. And so, a question: at whom are these girls looking at with such complex attitudes? Or, to use more precise artspeak: who is the implied narratee being addressed by these narrations of vulnerable and presumably impressionable girlhood? If we answer that Roberts’ works are directed at the generic, implicitly white and affluent artworld viewer, we get one answer, in that such viewers tend to not see the African-American experience with much clarity. Meaning, these works can be read as attempts to rectify that situation. Fair enough. But that is just the outer layer of what is going on here. Another layer has the girls looking at themselves in a mirror of self-interrogation, while a related layer might pertain to the cultural mythos of the absent African American father; meaning, these girls can be seen as seeking paternal recognition and approval amid pictorial voids that evoke isolation. But the most resonate layer of interpretation invited by Roberts’ collages is the way that they show young girls in a state of trying to either integrate or fend off the mixed messages of a manipulative culture that is all-too-eager to stereotype their identities, and thus, circumscribe their futures. In that way, they seem both innocent and anything but, defiant, precocious and understandably anxious, even frightened. In this reading, the implied narratee to which Roberts’ collages address themselves is the world itself, that vast and all-too-intimidating tsunami of overwhelming indifference and omnipresent potential for merciless exploitation. Often, there are indications of a happy tomorrow on their horizon, and in every case, they are portrayed to be balancing courage and anxiety as they face the unknown future, almost as if they want to confront and flee it at the same time. But, at the same time, they also uphold a kind of cautious optimism that borders on confidence, recognizing that giving in to despair accomplishes nothing. Deborah Roberts: “Uninterrupted” @ Jenkins Johnson Gallery through March 17, 2018. 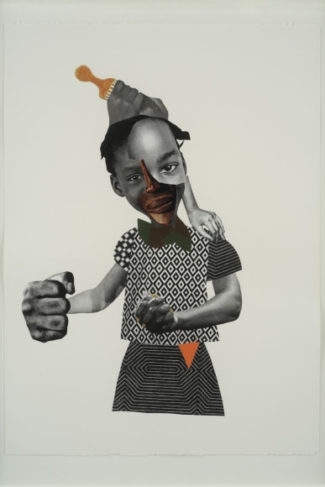 Images: Copyright Deborah Roberts, courtesy Jenkins Johnson gallery.